I don’t think Netflix knows who I am anymore. Maybe we are drifting apart or maybe there is someone else (using my password), but the things Netflix suggest I watch just are not right for me. It’s top pick for me is Mid Somer Murders. I mean, I know I just crossed int a new age demographic but COME ON, NETFLIX! Heading into my 35th birthday I didn’t think I had a problem with turning a year older. It’s just a number, right? I have no real desire to be back in my twenties, but at the same time I’m not quite ready to start eating fiber and watching The Mentalist. I guess the problem is the disconnect between how I feel and the perception of what it means to be 35. I realized this on the night of my birthday when I was asked my age. For a fleeting moment I considered lying.Why would I lie if I’m ok with my age? I told the truth, though it was difficult to say it out loud. I probably should have lied because the look on the guys face basically confirmed that 35 is very different from 34. I’ve crossed into new territory. So, armed with an array of moisturizers I’m facing this new world. Most days I can handle it. And for days when someone unintentionally does something that makes me feel old I have this Nutella Cookie dough in the freezer to help me dull the pain. 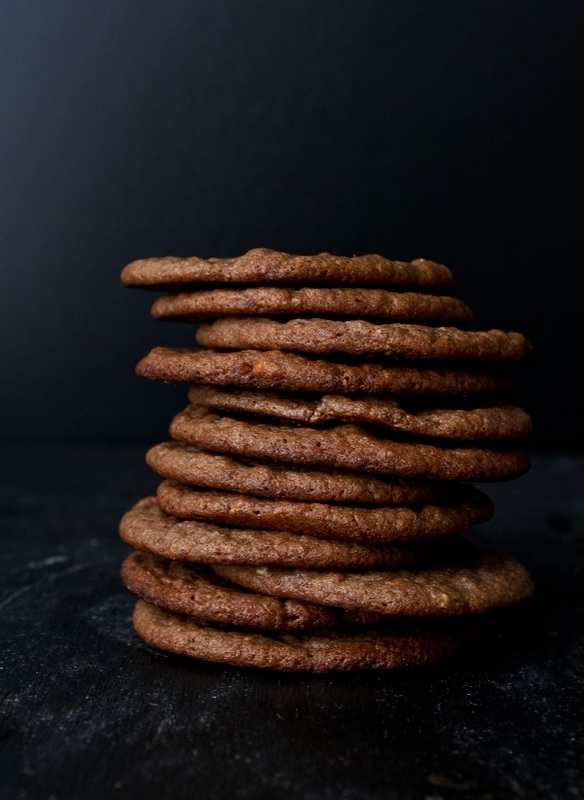 This recipe was adapted from the Momofuku Milk Bar recipe for Peanut Butter Cookies. I made some changes to the amount of granulated sugar and butter because to compensate for the difference between peanut butter and Nutella. The cookies were great, crispy edges with a chewy center. They did spread quite a bit; putting a little more flour would probably fix that though I haven’t tried yet. I’ll update this post when I do. Line a sheet pan with Silpat. In a heavy bottomed sauce pan make a dry caramel by heating the sugar over medium-high heat. Stir constantly until the caramel is a dark amber colour. Immediately take the caramel off the heat and stir in the hazelnuts. Pour out onto the silpat in an even, thin layer. Let cool completely then set aside. In a stand mixer fitted with the paddle attachment, cream the butter, sugar and corn syrup together on medium high-speed for 2 to 3 minutes. Mix in the Nutella, followed by the eggs and vanilla making sure to combine well. Scrape down the side of the bowl. In a medium bowl mix the flour, baking powder, baking soda and salt together. With the mixer on low, add the flour mixture. Mix just until the dough comes together. Add the hazelnut brittle pieces. Using a small ice cream scoop or tablespoons, drop tablespoon-sized portions of dough onto a cookie sheet. Chill the dough for at least 2 hours before baking. Do not bake at room temperature. Once the dough has chilled, preheat the oven to 375F. Bake the cookies for 8 to 10 minutes. Cool the cookies completely in the pan. A few days ago Marnely tweeted that she was eating granola instead of Nutella. The first thing that came to my mind was “why can’t it be both?” You may think that adding Nutella to granola is crazy, but I often add nut butters to granola to help it “clump” together. I saw no reason why Nutella couldn’t do the same thing. At first I was going to just use Nutella and not any other nut butters. I changed my mind because of all the sugar in Nutella. A variety of sugars gives the best consistency to granola, and if I went with all Nutella I wouldn’t be able to add more sugars. Well, I could.. but then I couldn’t even pretend that it was healthy. If you make your own hazelnut chocolate spread you could probably use just that without the granola becoming overly sweet. I used coconut sugar for the same reason, it’s not as sweet as regular granulated sugar. If you don’t have any on hand feel free to use regular sugar. My little experiment worked out really well. 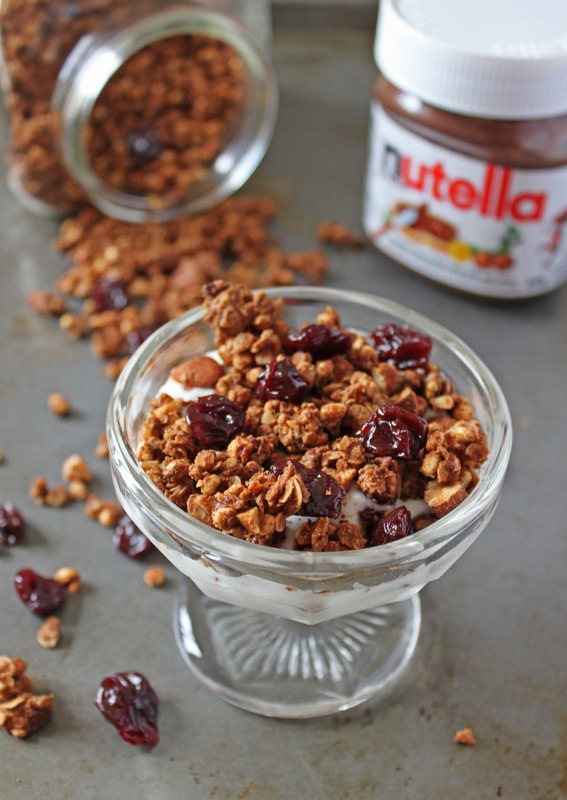 The granola tastes like granola, but with just a hint of Nutella in the background. The dried cherries gave it a really nice burst of tartness too. I ate some with milk tonight and it was like having Nutella cereal. So good! Preheat the oven to 300 degrees. Line a baking sheet with parchment and set aside. 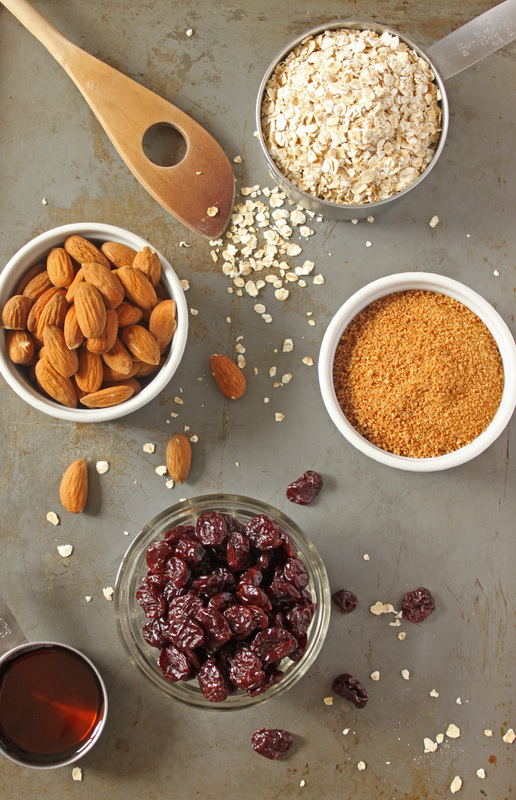 In a large bowl, mix the oats, millet, cinnamon and salt together. Set aside. Pour the butter mixture into the oat mixture. Stir until the oats are well coated. Pour the oat mixture out onto the prepared baking sheet in an even layer. Bake for 20 minutes, then stir and add the almonds. Bake for 20 minutes more. Let cool, then stir in the dried cherries. One year ago today I wrote my first post for this blog. When I started I really never thought anyone would read it. For a couple of months I was writing just for myself and the two other people I had told about the blog. Then I discovered Foodbuzz, and was introduced to a wide world of food bloggers. They were kind and supportive, and I like to think that some of the people I’ve “met” through Foodbuzz are my friends. I’ve been fortunate enough to get a few subscribers and regular readers. I want to thank all of you for reading my ramblings and sharing your thoughts with me. Your comments are always very much appreciated! My original plan was to remake the Amaretto Cheese Tart I wrote about in my first post. An unexpected condo visit on Sunday changed my plans. 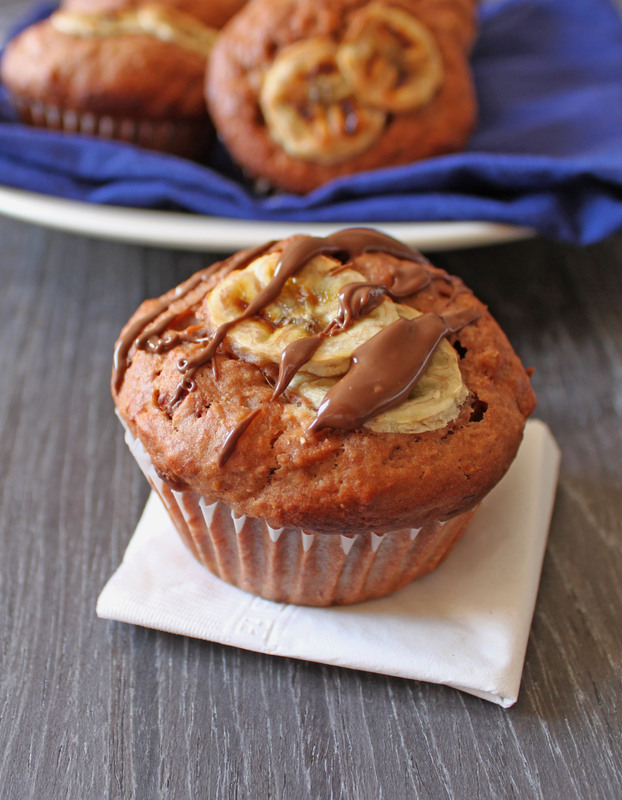 Instead I’m sharing these Banana Nutella Muffins with you. They seem fitting since muffins are probably the baked good I make the most. I was hoping for more of a Nutella swirl look to them, but I over-mixed the batter and lost the swirl. It’s ok, they still taste great, and the Nutella drizzle on top completely makes up for the lack of swirl inside. Don’t worry, I’ll make the tart soon! Preheat the oven to 375. Line a 12 cup muffin tin. In a large bowl, mix the flours, baking powder and salt together. In a separate bowl, mix the mashed banana, butter and egg together. Stir in the yogurt and vanilla. Mix the wet into the dry until just combined. Stir in the Nutella. Pour batter evenly into the prepared muffin tin. 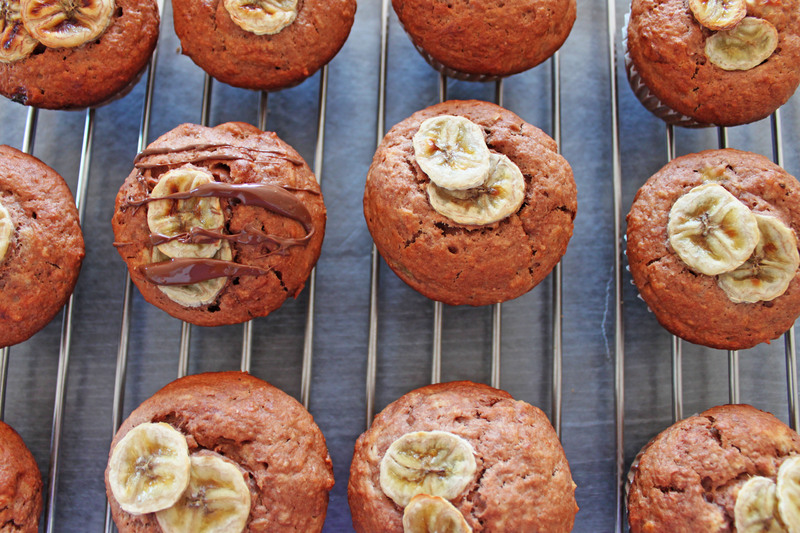 Top each muffin with thin slices of banana. Once done, cool on a wire rack. 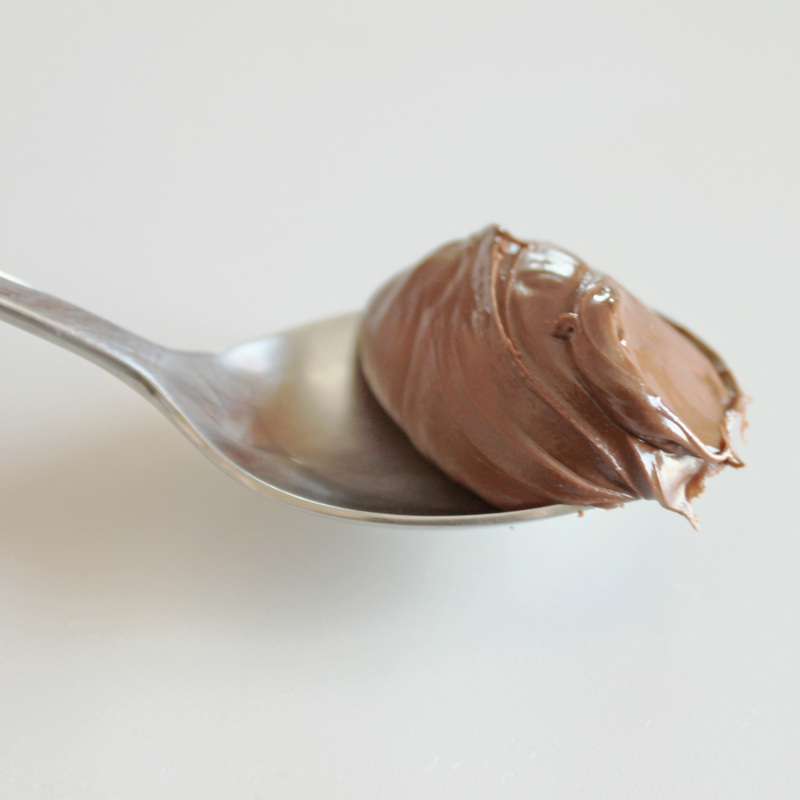 Drizzle with Nutella. February 5th is World Nutella Day. I may or may not have already mentioned this, but I looooove Nutella. I know it isn’t actually healthy, despite what the commercials say, but it is so delicious. Chocolate and hazelnut are just a match made in heaven. I think my favourite way to eat Nutella is slathered in a thick layer on toasted white bread. I’ve only started baking with Nutella recently. My first attempt at it was my Chocolate Nutella Bites. That was followed quickly by Abby Dodge’s Nutella Fudge Brownies. 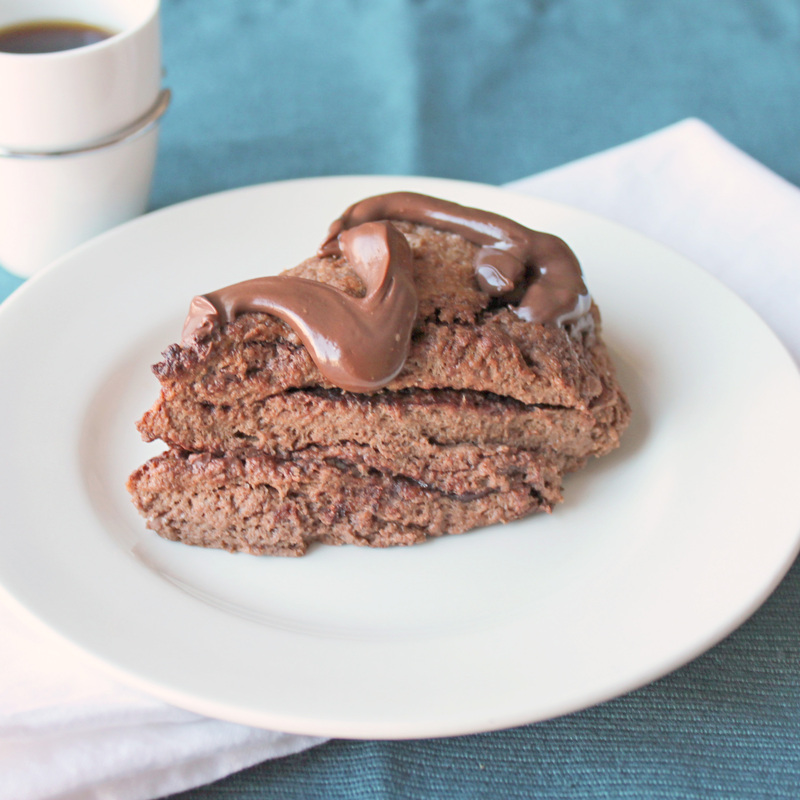 To celebrate Nutella Day, I decided to try these Nutella Scones from Baked Explorations. I’ve been eying the book since it came out, and based on how well these guys came out I think I have no choice but to buy it. The scones are incredibly addictive, I love the layers of Nutella baked between chocolate scone. 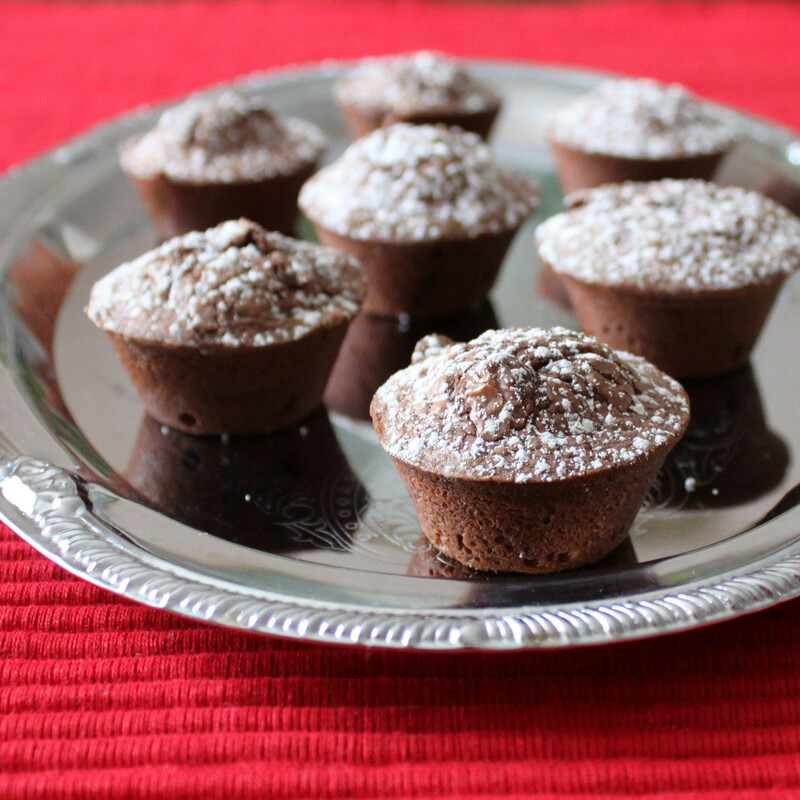 If you don’t have plans for Nutella Day, make these. Or you could celebrate with a nice big spoonful. Preheat oven to 375. Line a baking sheet with parchment or a silicon mat. In a large bowl, whisk together the flour, cocoa*, sugar, baking powder, and salt. Add the butter* to the flour. Using your fingertips, rub the butter into the flour until the chunks of butter become pea sized and the flour holds together when squeezed. Whisk the cream and egg together. While mixing, slowly pour the cream mixture into the flour mixture until the dough just comes together. Stir in the hazelnuts*, then pour the dough onto a floured surface. Knead the dough into a 6 inch by 12 inch rectangle (doesn’t have to be exact). Spread 1/4 cup of the Nutella over the dough, then roll it into a cylinder. Flatten the cylinder into a disk, then slice it into wedges (6 or 8). Once baked, place on a cooling rack. Warm the remaining 1/4 cup Nutella, then drizzle it over the cooling scones. The recipe calls for sweetened cocoa, I used unsweetened and found them to be sweet enough. For scones, cold butter is best. To get it into cubes, cut it while it’s slightly softened then put it in the freezer for a few minutes. I omitted the hazelnuts because I didn’t have any on hand. They would probably add a really nice crunch, but I didn’t really miss them. I made it 13 hours into 2011 before breaking my new years resolution. And then I had breakfast. I had resolved to cut back on the sweets. I’m going with the “it’s not my fault” excuse. There were a ton of desserts at our New Years celebration. My cousin picked up an enormous Gateau St. Honoré for my birthday and refused to let me leave without taking the leftovers home with me. A Gateau St Honoré is basically a giant cream puff. This one was filled with pastry cream, chocolate pastry cream, whipped cream, and even had some pieces of chocolate cake in it. I couldn’t let it go to waste. So I had a piece for breakfast. And another later in the day for dessert. So my New Years resolution starts.. Now! My contribution to the New Years celebration were Abby Dodge’s Nutella Brownies. If you read a reasonable number of food blogs, you’ve probably come across these already. A few months ago I saw post after post about how incredible these are. The reviews were right, these are awesome. I don’t know why I waited so long to make them. They are also incredibly easy to make. If you’re not much of a baker this recipe is a great place to start; there are only 4 ingredients and you don’t need to know any baking techniques. If you can mix (or have a mixer) you can make these brownies. I found this recipe at Savory Sweet Life. Preheat oven to 350. Grease a mini muffin tin. In a large bowl mix the Nutella and egg together until smooth. Add the flour, mix until completely incorporated. Try not to eat the batter, there is just enough to fill the muffin tins. Pour batter into mini muffin tin, filling till about 3/4 full. Let cool completely, then dust with icing sugar. The idea for these cookies came to me in the shower, which means it could have been genius or madness. A ball-shaped shortbread cookie with a Nutella filling, sort of like a cookie truffle. There were some technical issues that had to be addressed, namely how to make a ball out of a spread. My solution was to chill the Nutella for 30 minutes, scoop it out using a mini melon baller then freeze the balls for 30 minutes. The next issue was would the cookie dough hold its shape, or would they turn into a leaky Nutella mess? The only way to find out was to try, and these were a definite success. They kept a fairly round shape, and the Nutella stayed put in all of them. Best of all, they were delicious; the perfect blend of chocolate and hazelnut flavours. I think these are destined to become a holiday tradition. Put the Nutella in the fridge for at least 30 minutes till hardened. Using a mini melon baller scoop out 24 balls, place them on wax paper then freeze for 30 minutes. While the Nutella is freezing, make the cookie dough. Melt the chocolate with the espresso powder, set aside. In a large bowl, beat the butter and sugar together until fluffy. Blend in the chocolate, followed by the cornstarch and salt. Mix in the flour until a smooth dough is formed. Shape the dough into a log, cover in plastic wrap and refrigerate for 20 minutes. Once the dough has chilled, slice it into 24 even circles. Take a circle, put a Nutella ball in the center then using your hands roll it into a circle, making sure there are no seems. Repeat for the remaining dough/nutella. Refrigerate for 30 minutes. While the cookies are baking put your face up to the oven window and watch. Pray your cookies don’t leak. 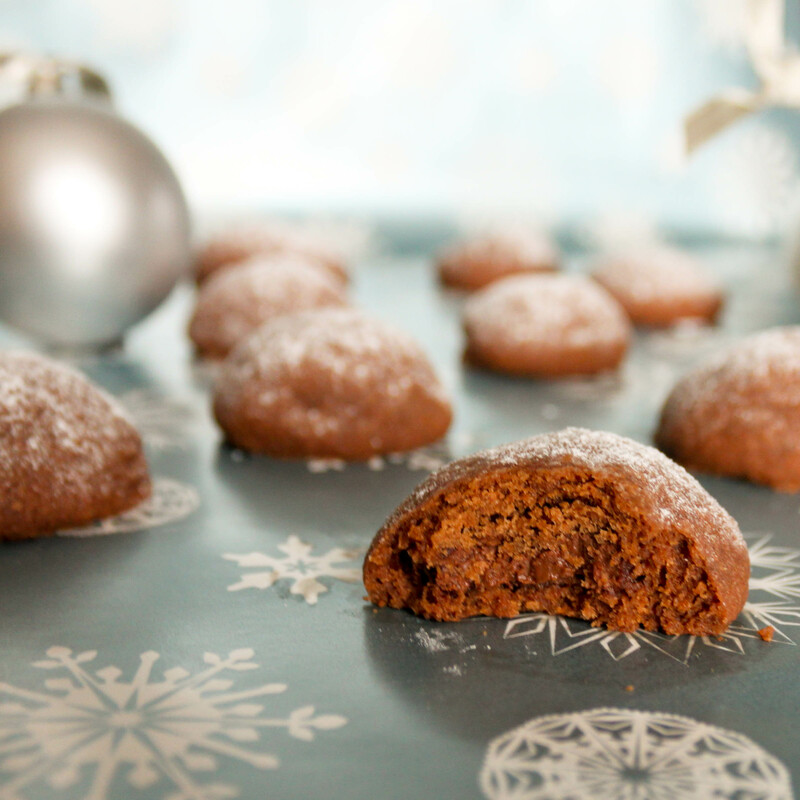 Once cooked, let them cool completely then sprinkle with icing sugar.